Traditional local news media are facing unprecedented challenges in the rapidly changing digital environment. Led largely by younger consumers, the public has shifted its news consumption habits from television and newspapers to online sources and social media. 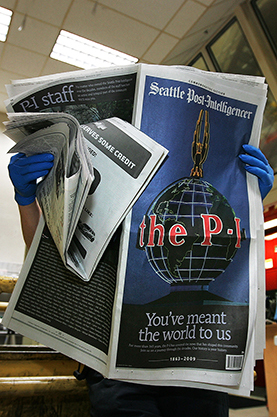 Audiences, readership and revenues have plummeted, and more than 1,800 daily and weekly newspapers have gone under since 2004. Meanwhile, media conglomerates have bought up scores of local TV stations, with one company, Sinclair Broadcast Group, even requiring employees to read conservative editorials on the air at all its stations. At the same time, huge swaths of the country have become “news deserts,” with no newspaper to monitor local government. Many news outlets that remain have slashed staffs, raising questions about their ability to cover local government or provide other community news needed for an informed citizenry. Alternative online news sources, some specializing in specific topics such as local sports or education, have sprung up to fill the void. But some analysts believe such outlets cannot provide the kind of in-depth, objective reporting required to support democracy.